Today Google announced a new service, Google Public Alerts, which has been integrated into the existing Google Maps. The new platform will provide users with up-to-date information on emergency messages, such as hurricane and storm warnings. Google will be providing weather, public safety and earthquake alerts, throughout the United States, using information provided by the US National Oceanic and Atmospheric Administration (NOAA), the National Weather Service, and the US Geological Survey (USGS). Users can search for key terms and locations to find out more about what is happening in their area. 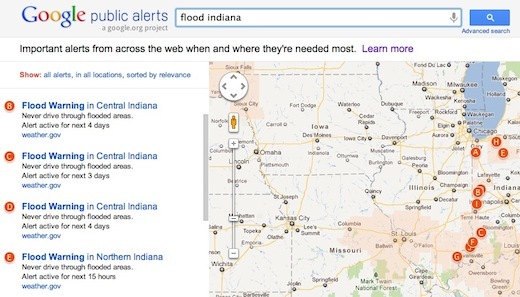 Google gives the current example of searching for flood warnings in Indiana, and users will receive a list of warnings throughout the state. Clicking on any given warning will provide detailed information on the location, the severity of the threat and what action you can take to stay safe. If you want to keep up-to-date with all of the public alerts, regardless of whether or not they’re in your area, Google’s new service provides a centralized and easy-to-access site with the latest on all of the current alerts in the US. Google Public Alerts is not available for all cities throughout the US, but as the partnerships expands, you can expect to see more data available through the service.